Today is the feast day of the three archangels named in the canon of Scripture: Michael, Gabriel, and Raphael. While I love all three, I’m partial to one. When I was confirmed by Bishop Patrick Zurek, he anointed me saying, “Archangel Michael, be sealed with the gift of the Holy Spirit.” I chose this name because I knew that the anointing at Confirmation has its roots in the ancient anointing of warriors before battle, and Confirmation would launch me into spiritual warfare with Michael’s name on my forehead. Revelation also describes Jesus, King of Kings and Lord of Lords, as a warrior riding on a white horse, leading “the armies of heaven” (19:14). Scripture tells us that Michael is a prince (Daniel 10:13, 21) of the King and continues to rebuke Satan (Jude 1:9). 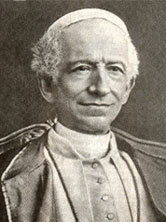 Pope Leo XIII (one of my favorite popes) wrote a prayer in honor of St. Michael, which I pray often. Pope Leo was compelled to write this prayer after experiencing a sudden vision—in the middle of a meeting with the conference of Cardinals—during which he saw Satan and his legion of demons trying to destroy the Church. 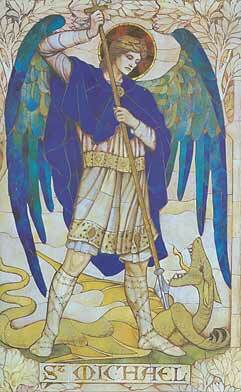 But, in the midst of the battle, Archangel Michael came and cast Satan and the demons into hell. Exorcists always note that Satan has no power on his own; all power and might come from the Creator. This is what Michael reminds us: in order to possess true might, we must reflect the humility of God. On June 13, 2002, 500,000 pilgrims gathered in front of St. Peter’s Basilica in Rome to join Pope John Paul II proclaim Padre Pio of Pietrelcina a saint! I was privileged with the honor to organize a pilgrimage from San Antonio for Padre Pio Parish. There were around 30 from San Antonio that journeyed to Rome for this historical event. As we stood for several hours in St. Peter’s Square waiting for John Paul II to begin Mass, I began to think about my experience with Padre Pio. Tom, my husband, and I had visited San Giovanni Rotondo several years before. This is a small town along the east coast of Italy. It is where Padre Pio lived most of his life as a Capuchin Friar in a monastery, praying, offering daily Mass and hearing Confessions daily for several hours. He died in 1968, so he is considered a modern day Saint! When visiting his monastery, we were able to see his ‘cell’ (room), personal belongings such as his habit, shoes, prayer book, Bible and rosary. His cell was simple, but it gave witness to Padre Pio’ simple and humble life! I will never forget that pilgrimage to Rome in June 2002. It was well worth standing for hours in the summer heat of June, in the midst of the crowd of thousands. Hearing John Paul II’s words about Padre Pio, united in prayer and with much joy with a ‘spiritual friend’ in Heaven and with so many persons from all over the world who knew this “humble, prayerful servant of God”! Follow me! – Who, me?! Today is the Feast Day of St. Matthew, when the Church remembers St. Matthew, one of the Lord’s Apostles and his conversion. 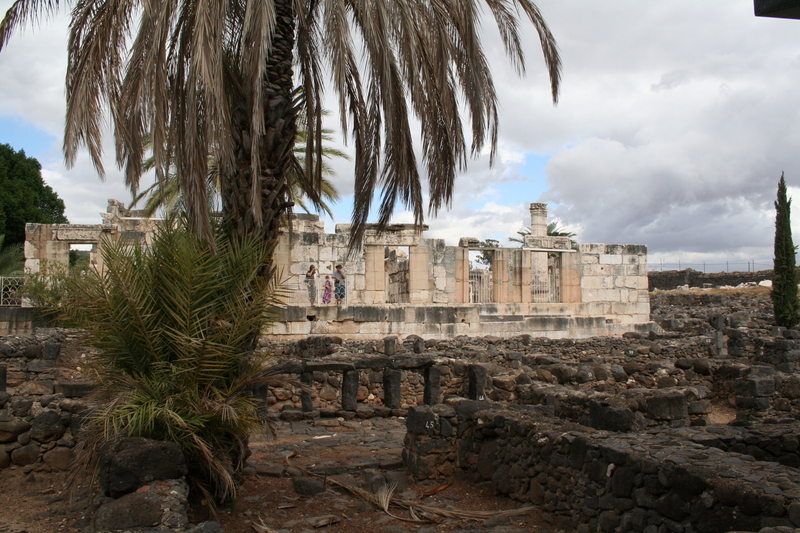 It occurred in Capernaum, by the Sea of Galilee where Matthew worked as a tax collector (yes, that was not a popular job; most tax collectors in those days were known to ‘cheat’ from others). Jesus while in Capernaum sees “a man called Matthew sitting at the tax office, and he said to him: Follow me. And he got up and followed him.” (ref. Matthew 9:9). I always found this passage intriguing…how someone who hears the words of Jesus to follow him, gets up, leaves everything and follows Him! Jesus saw Matthew not merely in the usual sense, but more significantly with his merciful understanding of man. … Our Lord summoned Matthew by speaking to him in words. By an invisible, interior impulse flooding his mind with the light of grace, he instructed him to walk in his footsteps. In this way Matthew could understand that Christ, who was summoning him away from earthly possessions, hand incorruptible treasures of heaven in his gift. We can take those same words from Saint Bedes’s homily directed to us: “Jesus sees you/me! When we experience the gaze of the Son of God, our Savior, how can we not be changed? Whether that gaze is an experience at a retreat, an encounter in prayer, by meeting someone, on pilgrimage or even through trials and suffering. The gaze of Christ can reach our interiority and flood our minds with the light of grace. 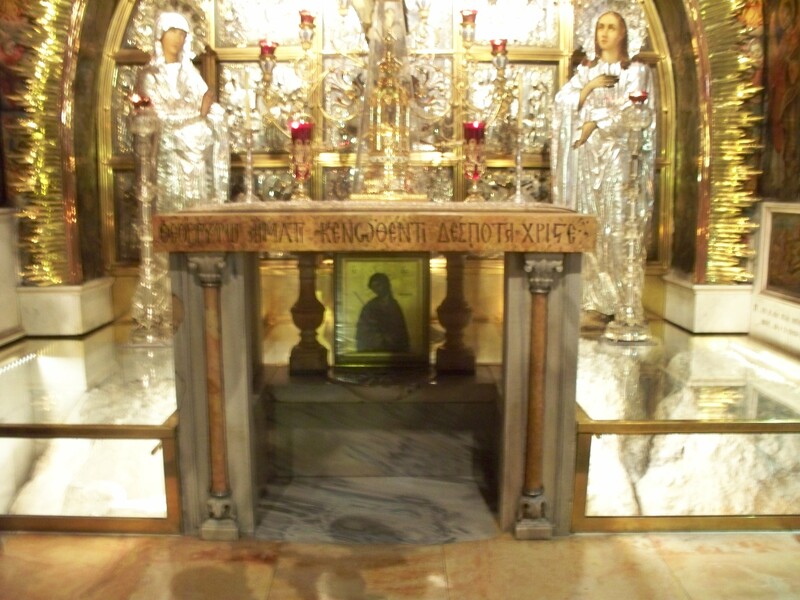 The altar at Calvary in Jerusalem; Rock of Calvary can be seen below the glass. When Tom and I were in Jerusalem for the first time (we have journeyed to the Holy Land several times), we purchased a large hand-carved olive wood crucifix for our home—and two small ones with a tiny piece of calvary embedded in the bottom of the cross. These small crosses are unique; they can be only be obtained through the Franciscans in Jerusalem. Often when we pray in our Center’s chapel, “Gethsemane” holding these crucifixes in our hands as a reminder of our Lord’s love, his Passion and Death on the Cross, and ultimately his victory. Conversion ain’t pretty or easy. Violent imagery is central in today’s first reading (Col. 3:1-11). His words remind us of the brutal crucifixion of Jesus, who was put to death for our sins. Paul instructs that, through baptism, we “have died” and “have been raised with Christ.” But have taken the effort to truly put to death these things within us? The reading reminds me of a powerful classic film released in 1953, The Robe. In it, we meet Marcellus, a Roman soldier who assisted in Christ’s crucifixion. He comes to believe that Jesus’ robe has put a curse on him, since he is tortured with the guilt of his actions. The Roman emperor gives him a commission: find & destroy the robe, and discover the names of Jesus’ followers. In Marcellus’ journey, he encounters small Christian communities and even some apostles. They influence his eventual conversion to follow the Man whose death had haunted him for years. How was he able to radically convert? Marcellus learns about the Resurrection and the Love that Christ has for him. have put on the new self, which is being renewed, for knowledge, in the image of its creator. but Christ is all and in all.